Pinwheel Galaxy was discovered by Messier on Aug. 25, 1764. This very large, almost face-on spiral, contains many star associations, dark nebulas and star forming ( H II ) regions - the most prominent of those, NGC604 (near upper right corner above), is easily noticed visually in small telescopes. Spiral arms are more challenging because of their low contrast. 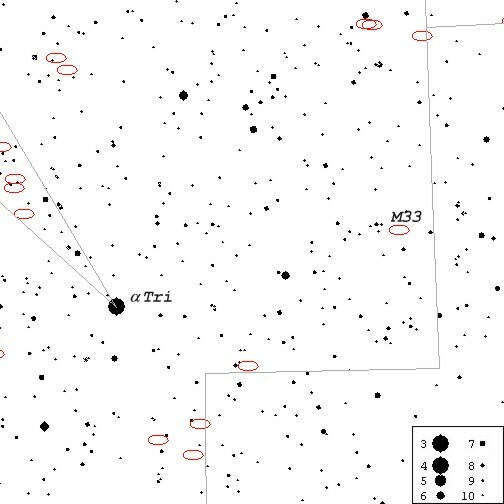 Measuring about 40,000 ly across, this member of Local Group is 2.4 million ly away and contains only approx. 20 billion stars. 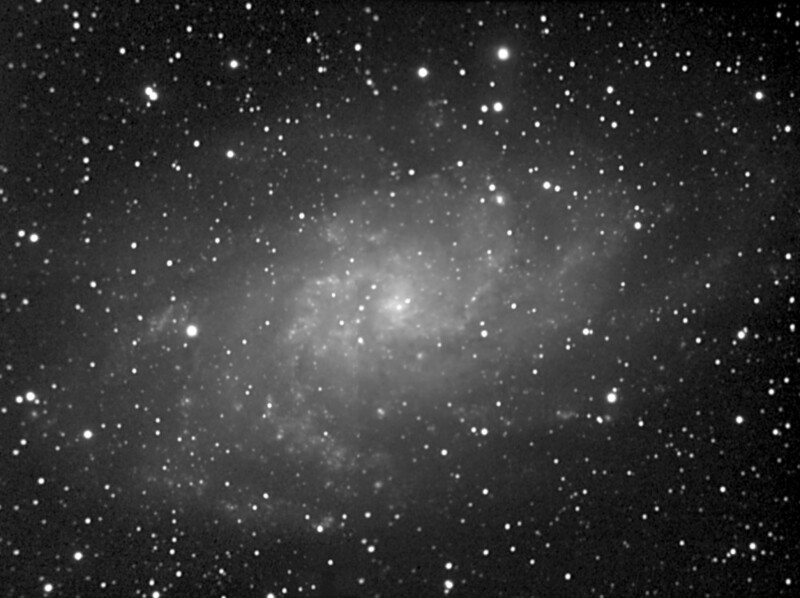 M33 image above is a mosaic of 4 tiles taken on Sept. 20, 21 & 23, 1998 from Sooke, BC using Cookbook 245 LDC CCD camera on Ultima 8 f6.3 telescope, autoguided with Cookbook 211 LDC CCD camera on piggybacked 500mm f8 telephoto lens. Each tile was composed of white images ( 8 or 9 x 4 min.) as well as cyan, magenta and yellow-filtered integrations ( 4 x 4 min. each ) processed with AIP4WIN. Color images were adjusted in Lab color space and mosaic was assembled with PhotoPaint 8. 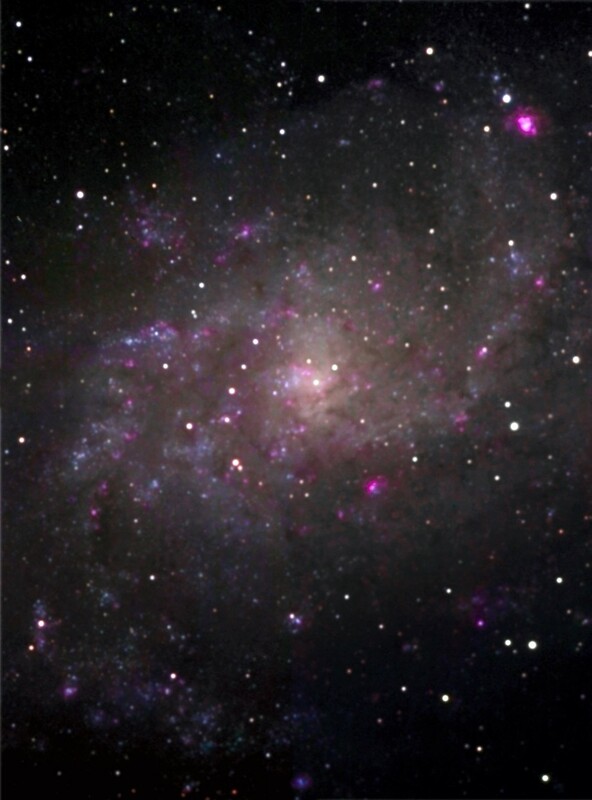 Wide field mosaic below shows the faint outer areas of M33. 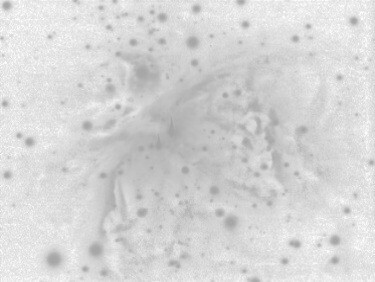 It was assembled from 4 tiles, each composed of four white (-IR filter) images (240 sec. each) taken on January 29, 2000 from Sooke, BC. Celestron Ultima 8 SCT f3.0 was used without guiding to acquire those integrations. Images were processed with AIP4WIN, then Corel PhotoPaint 8 was used to put the mosaic together. This image is reduced in size to 75% of the original. North is to the right.